Many of us rely on our phones to give us the latest weather update. With the advancements in technology, it’s easier than ever to get a reading of the upcoming weather. However, there’s a big issue with some of these predictions. The chances are that the weather readings are just an estimate of what’s going to be happening, not real readings. To get a better reading of the weather, choose to install a home weather station. This will give you accurate weather readings around your area. In this article, we will help you pick out the best home weather stations. This is a professional-level weather station that claims to provide you with accurate readings. It will monitor the weather around your home and give you exact statistics and predictions on an easy-to-read LCD screen. Moreover, you can also get updates from the system and onto your phone through the Ambient Weather Network. 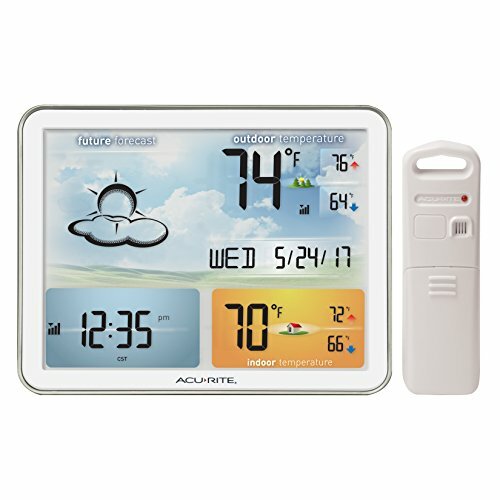 This weather station gives you accurate readings and then displays them on its large LCD screen. 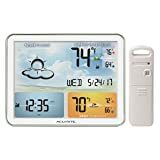 It may be hard to read weather reports from a small screen, but with this particular weather station, you’ll be provided with a 3 x 6.75-inch display. The Ambient WS-2902A Weather Station relies on a Wi-Fi connection to transmit its findings wirelessly. This means that there’s no complicated wires or setup required. 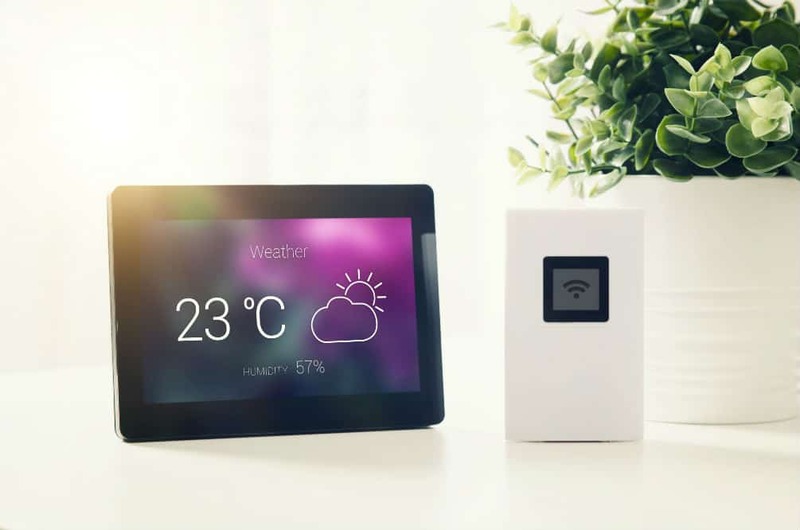 Instead, it connects directly to Wi-Fi and transfers all of the data from the weather station to an online weather station network. It’s more convenient to have accurate readings sent from your weather station to your devices. So, to add to your convenience, this device allows you to check the weather readings from any device that has access to a Wi-Fi connection. You can send them to computers, tablets, or any Wi-Fi-ready mobile device. This weather station will record and measure various weather conditions including wind, wind direction, and speed. The Ambient WS-2902A also measures rainfall, temperature, humidity, radiation, and UV levels. This provides you with all the essential weather reports that you usually wouldn’t find on a regular weather app. This weather station also comes with humidity, temperature, and barometric pressure measurements. This provides you with a very accurate reading of the weather around your home. You will also be sent data of dew points, wind chill, and heat index alerts. We enjoy that this weather station takes multiple measurements to give you a better picture of what the weather will be like. It makes accurate predictions, which can all be monitored by any device with Wi-Fi access. Then again, the fact that it does run through Wi-Fi means that there must always be a stable connection. If the internet drops, then you won’t be able to get any network data, and the system will not record any information. It’s always important to plan your day according to the weather. The AcuRite 02081M uses unique and enhanced pinpoint accuracy to provide you with the latest weather conditions. The sensor is installed into your backyard and will allow for 12- to 24-hour weather forecasts. This helps you have an accurate reading of the weather in your surrounding area. Sometimes, it’s hard to read what’s on a tiny display. Luckily, with the AcuRite 02081M, you can rest assured that this won’t happen because it features a large, colored display. It’s easy to read all the data displayed from its 8 x 6-inch monitor. The display can be mounted on a wall and features a slim profile. The thermometer will track both indoor temperatures and outdoor temperatures. This can help you keep track of high and low data, which are recorded in either Fahrenheit or Celsius. There is no need to adjust the time and date for this weather station. It automatically adjusts to the right time and date, including daylight saving time. The AcuRite 02081M is hooked up to the National Institute of Standards and Technology, which keeps the system updated. Unlike other weather stations, this one uses a self-calibrating system that reliably predicts a weather report. AcuRite 02081M also uses tracking to collect changes in temperature and pressure and then uses the data to build an accurate report. Out of all the weather stations on this list, the AcuRite 02081M features the best prediction software. Unlike others, it doesn’t rely on information gathered online or from other websites. Instead, it collects data and then builds a representation of what it thinks is going to happen. While this unit does have a large display screen, some say that it is pretty hard to read the report from far away. This means that you’ll need to set up the display where you can stand in front of it and read the data easily. Trying to find a display that’s easy to read and interprets data so that you only need a quick glance is hard. However, with the La Crosse Technology S85814, you can have the display screen set up anywhere in your home. It provides you with a comprehensive display of temperatures, humidity, and forecast data. The display on this weather station is one of the best-looking screens on this list. It features six color forecast icons, which make it easy to tell what kind of weather it will be like throughout the day. Displayed on the background is a colorful forest, which changes with the seasons. On top of that, it features adjustable backlighting that is powered by three AA batteries. Another benefit is that it will automatically set the time and date without needing to be adjusted for daylight saving time. Other weather systems require wiring and must be hooked up to a computer—but not this one. The La Crosse Technology S85814 is a wireless system that functions via Wi-Fi connection. All of the data recorded will be uploaded to a forecast display, which is then transmitted to the screen up to 300 feet away. The display will also give an animated forecast by playing animated pictures of rain, snow, wind, and more. This gives you a better idea of what the day is going to be like with just one glance at the screen. As for the display, it features indoor and outdoor temperatures, humidity, heat index, and dew points. Lastly, the La Crosse Technology S85814 also features a weather-resistant exterior, which ensures that the sensors will be protected and function even in bad weather. Each sensor has ample ventilation for the hot summer, features moisture drainage, and has a sturdy exterior. The display is what makes this weather station stand out. It can be hard to interpret all the collected data from a normal weather station, and looking at a bunch of jumbled numbers may not make sense if you’re using it for home use. However, this weather station features animated displays of the data and weather, making it easy to interpret. A major setback with this weather station is that the battery will only last for two weeks at a time. This can be costly if you’re not expecting to pay for batteries constantly. For this, you can invest in some rechargeable ones so as to save on expenses. Everyone plans their day based on the weather, and if you get the wrong report, then you may have to cancel your plans. 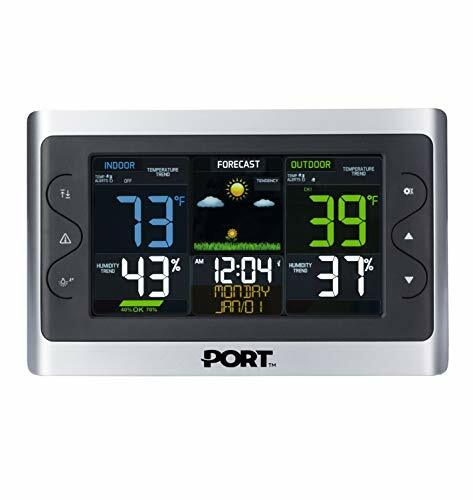 This unit from PORT is a home forecast weather station that enables you to get accurate and reliable weather updates. This system features accurate readings and predictions for temperature, humidity, and more. This system enables you to have full control over the weather reports and other features. You can use it as an alarm clock, weather forecast predictor, and as a clock too. It will display the date, time, and other important weather updates that the sensor picks up. The remote has a very large transmission range of 100 feet and can be used both indoors and outdoors. You can use it to keep track of the temperature in your bedroom, office, or in your backyard. The PORT Weather Forecast Station is best used on your nightstand. The alarm system works well for those who want a device for multiple uses, and it will keep you updated with real-time data from outdoors and indoors. You can use it to monitor the temperature, humidity, and other vital predictions for the weather. The display measures 6 x 6.9 inches and comes with a wall hook, which means that you will be able to hang it up or place it on a desk. Either way, the system is very portable, but keep in mind that it only has a 100-foot range. 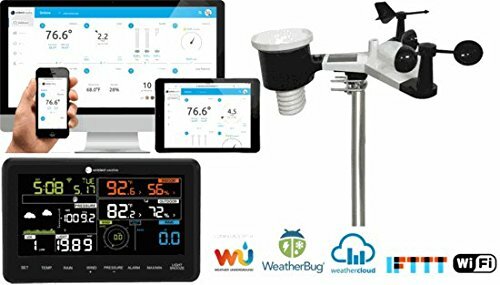 Overall, the system stands out because of the other extra features that make it more useful than just a stand-alone weather station. It has an alarm feature, a calendar, and it can be used to track and predict the weather both indoors and outdoors. The system can be powered via a connection cord or batteries. However, there are some users who have stated that the power cord isn’t reliable and may not always charge the system. Hence, it’s best to use batteries, as this will save you the hassle of hooking it up. 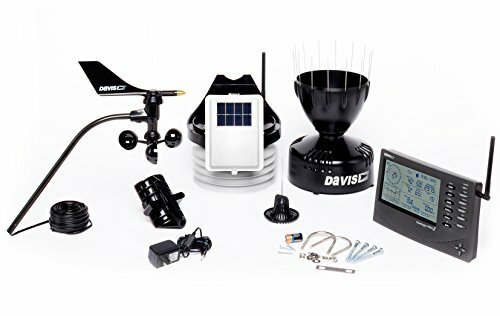 If you purchase a weather station from Davis Instrument, you can ensure that your system will be strong, durable, and give accurate results. Each system is designed to withstand the hot summer sun, corrosion, rust, winds, and extreme temperatures. This is how you know you’ll have a reliable working system for years to come. At-home weather stations must be reliable and precise, and with this unit from Davis Instruments, you’ll have a professional-grade weather station. You can customize it to your liking by purchasing additional consoles and sensors, which will give you even more detailed weather readings. It’s not uncommon for other weather stations to give poor rainfall measurements, but the rain collector feature on this unit is genuinely advanced and boasts a new and improved design. With this, the system will be able to provide very accurate results even during high winds. This system boasts a wide range of sensors that can be used. It already comes with temperature, rainfall, wind speed, humidity, and a UV-measuring system, yet you can still add more sensors, enabling you to adjust it to your liking. This device uses a 40-foot anemometer cable, which can be mounted a bit further away from the rain collector. This ensures that your setup isn’t overcrowded and enables you to make adjustments as needed. The anemometer is durable, high quality, and has considerable range. Some unusual features include a wirelessly integrated sensor suite, a console display with a backlit LCD, and the ability to be mounted to a tripod. Although, the tripod will need to be purchased separately. Not everyone is interested in knowing all the details of the weather on a given day, as some need it for home use. However, if you’re looking to track the weather effectively, then this is a great weather system. It is a highly customizable system that allows you to pick and choose what types of sensors you want. Our only issue with this model is that it is an extremely pricey weather station. If you’re purchasing it for home use and not planning on using it professionally, then we suggest that you get another model that has a more budget-friendly price tag. When it comes to finding the best weather station, things can be a bit overwhelming. However, knowing exactly what features you want in a weather station can help narrow down your search. After all, not everyone needs a fancy weather station with professional sensors. Instead, if you’re using it for home use, then it may be best to only look for temperature, humidity, rain, and wind measurements. There are multiple types of weather stations, and knowing which type you need can help narrow down your search. For this article, we’ve been reviewing home weather stations. However, there are also professional and portable weather stations available. A home weather station is one system that comes with already built-in sensors. Although, this ranges with each home weather system brand. Most models come with temperature, humidity, and rainfall sensors. Other measurements include atmospheric pressure, wind speed, UV rays, and wind direction. On the other hand, a professional weather station is much different than a home weather station. It features more accurate and reliable measurements and includes a more durable build. Professional weather stations are used by government organizations to help detect the weather. These come with sensors that can track soil temperature, water temperature, and wetness, along with all that a home station has to offer. Lastly, there are portable weather stations. These are handheld units that can be used anywhere. The only downside is that these won’t have the most accurate readings. However, they are useful if you’re traveling and need to get a more reliable weather prediction. Portable weather stations only have general sensors and features. Most modern weather stations use Wi-Fi connectivity instead of wires and cables. This is much more effective at sending data from one network to another, enabling you to check from any device that can connect to the internet. But then again, there is a limit to how far a sensor can connect to a display. Most models only have a maximum range of 100 feet. Although, some advanced models can send information up to 300 feet away. One of the most crucial factors of any home weather station is the display. If you have a hard-to-read screen, then you may find yourself frustrated with trying to understand the data displayed on it. Modern displays will have LCD backlit screens, which feature large numbers and letters. On the other hand, some also come with animated backgrounds, which make everything easy to read at a glance. The very last factor to consider is the price. A high price tag doesn’t always mean that it will be the most reliable or accurate machine. We would still recommend finding a weather station within the range of $50 and $200 for home use. Any less and you’ll find that the readings are way off. Anything higher than that will generally be useful for those looking to add on extra sensors. 1. What is a weather station? A weather station is a type of device that helps collect measurements relative to the weather in the surrounding environment. They are customarily equipped with sensors that help measure temperature, wind, rain, and barometric pressure. These devices range from analog technology all the way into more modern digital versions. 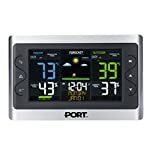 Before the new age of technology, weather stations would have to be wired into your home and connected to your computer. This often was a hassle, as you would need to drill holes, remove interior and exterior layers to your home, and also connect the wires yourself. Luckily, modern weather stations need only to be connected to Wi-Fi, and they will directly update weather measurements to a database. You will then be able to access this database either via an app, an internet connection, or through smart devices. 3. 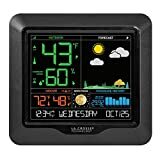 How to set up a weather station? The most important factor of a weather station is knowing where to place it. If you want the most accurate readings, then it’s best to install a weather station in a clear and open area. You want it to be in a location where it can measure all types of weather. If a tree is blocking it, if it’s too close to your house, or if it’s in an alley, then you may not get an accurate reading. Always place your weather station in an area on your property that has no obstacles blocking its way. As long as nothing comes into contact with it and blocks rainfall, sunlight, and the likes, then you will be okay. Then again, having it too far away from your home can cause it to not work because of the range. 4. How to calibrate a weather station? It’s not that complicated to calibrate a weather station. Although most home weather stations come with automatic calibration, we’ll walk you through a few simple steps that you can take to manually calibrate your weather system to ensure that it’s working. First, purchase a thermometer at a hardware store and place it next to your home weather station sensor. It should be lined up with the thermometer in your weather station and will need a few hours to stabilize. Once it has stabilized, you can then check the temperature on both thermometers. If the temperatures are not relatively the same, then you may need to adjust the settings on the weather station. If they are the same temperature, then your home weather station is working properly and doesn’t need to be calibrated. If you’re installing other sensors, then you may also need to calibrate those as well. To calibrate humidity, you may need to purchase a hygrometer calibration kit and follow the instructions on it. On top of that, you may also need to calibrate barometric pressure, which requires you to match the batrometric readings with that of a professional weather station in your area. 5. How to mount a weather station on a pole? Take the batteries out of the sensor. Search for the ABC switch, which will be located next to the battery. Turn the switch to A and choose the same channel the switch is being displayed to. After this, insert the batteries into your sensor or charge it. Take a pole and use four screws to mount the base of the station onto the pole. Once the mounting base is secured, you will then need to attach the sensors. Secure the sensor with two more screws. Once it’s secured, remove any tape or adhesives that are on the sensors. Overall, there are multiple home weather stations that you can choose from. However, after careful consideration, we have concluded that the best home weather station among the rest is the Ambient WS-2902A Weather Station. The reason for this is that it’s affordable, comes with a large and easy-to-read display, and it records all the basic weather conditions. Previous Post Best Wake Up Lights of 2019: Complete Reviews with Comparisons Next Post Where to Place Outdoor Weather Sensor for Accurate Readings?